I have been using the Omved All Purpose Ubtan for almost two years now and also gifted and recommended this to many of of friends. The best part part of this ubtan is that it doubles as a pack and a scrub. I am more inclined to use this as a scrub because I don’t have the patience to use a pack. Notice the consistency in the pic? 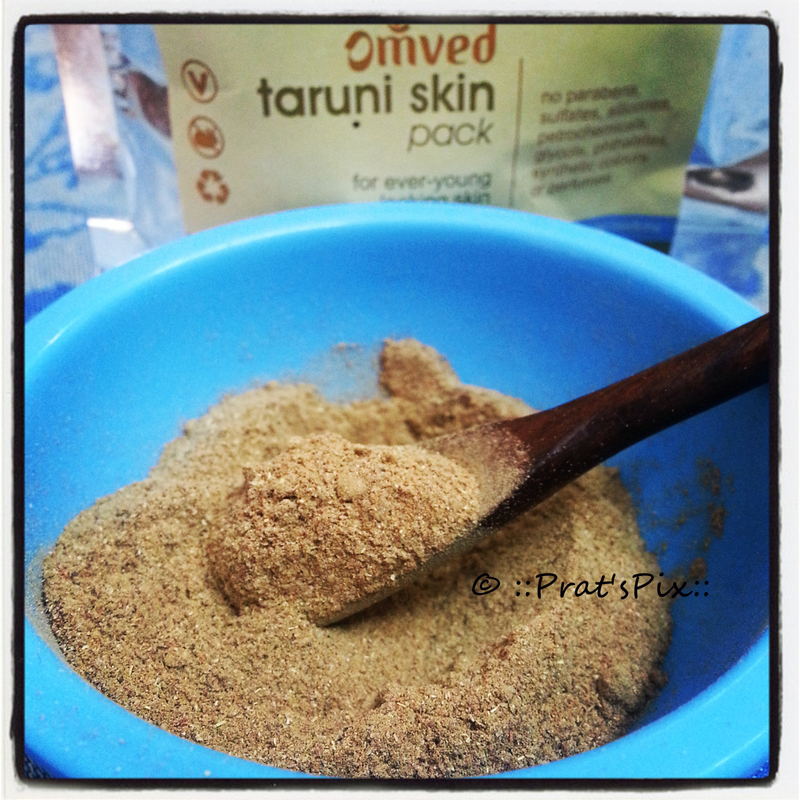 The Taruni pack is more flaky/grainy and seems on the rougher side in comparison to the All Purpose Ubtan. It has a very unappealing fragrance and luckily the fragrance takes a back seat when you mix it with rose water and aloevera gel. I have used this a couple of times and it did not dry out my skin. The first time I applied this pack (as a face pack), it was itchy for about 2 minutes and then the intensity of the itching reduced. I washed it off in about 7 minutes. But it left my skin a bit stretchy and dry. The second time I used it as a scrub, I made a thinner paste and massaged my face for about a minute and washed with cool water. This option worked for me. If you have sensitive skin do a patch test. This 25 gm pack is priced at INR 120 and has a shelf life of two years. This pack last about 7 – 8 uses for me because I do not apply a very thick layer of pack on my face and I most often than not like to use it as a scrub and not a mask. You can buy this from Omved, Junglee, Natural Mantra and GreennGood. No. I prefer the All Purpose Ubtan, so I will stick to that. This one is a bit cumbersome to use as a face pack because as it starts drying, the flakes or the husk start falling. Also the pack is a tad difficult to apply because of the texture. I have used this twice as a pack and both the times I have not been able to apply it *smoothly*. This one is good for those who like to apply a face mask/pack and relax. What I won’t deny is that your skin is visibly radiant post the usage of the mask. A classical Ayurvedic recipe, this nutrition house of herbs is a blend of 13 of the most important and essential skin-enhancing herbs as recommended in Ayurveda and mineral-rich mud from river beds, found in certain pristine parts of India. • Nagarmotha de-toxes and lightens skin. • Lodhra improves complexion and tone. • Orange peel powder gives elasticity to the skin and strengthens and rejuvenates it. • Ashwagandha slows down the ageing process and counteracts premature wrinkles. • Fuller’s Earth absorbs excessive sebum. Prepare mask by mixing with water/pure Rose water/Aloe Vera gel into a paste. After cleansing, apply on face and neck in soft circular motion in upward strokes to form a smooth layer. For daily use, leave on for 5 minutes. For weekly deep cleansing treatments, leave on for 20 minutes. Rinse. Moisturise.